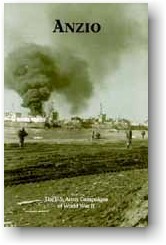 This brochure was prepared in the U.S. Army Center of Military History by Clayton D. Laurie. I hope this absorbing account of that period will enhance your appreciation of American achievements during World War II. 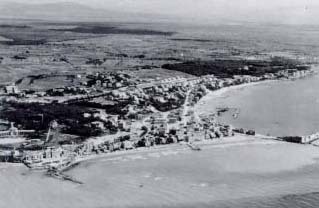 During the early morning hours of 22 January 1944, troops of the Fifth Army swarmed ashore on a fifteen-mile stretch of Italian beach near the prewar resort towns of Anzio and Nettuno. The landings were carried out so flawlessly and German resistance was so light that British and American units gained their first day's objectives by noon, moving three to four miles inland by nightfall. The ease of the landing and the swift advance were noted by one paratrooper of the 504th Parachute Infantry Regiment, 82d Airborne Division, who recalled that D-day at Anzio was sunny and warm, making it very hard to believe that a war was going on and that he was in the middle of it. the rugged Apennine Mountains overlooking scores of rain-soaked valleys, marshes, and rivers. The terrain favored the defense and, as elsewhere in Italy, was not conducive to armored warfare. Luftwaffe Field Marshal Albert Kesselring, whom Hitler had appointed as commander of all German forces in Italy on 6 November 1943, promised to hold the Gustav Line for at least six months. As long as the line was maintained it prevented the Fifth Army from advancing into the Liri valley, the most logical and direct route to the major Allied objective of Rome. The validity of Kesselring's strategy was demonstrated repeatedly between October 1943 and January 1944 as the Allies launched numerous costly attacks against well-entrenched enemy forces. Mountains along whose southeastern edge ran the Pontine Marshes extending to Terracina. The proposed beachhead was bounded in the north by the Moletta and Incastro Rivers, in the center by open fields leading to the villages of Padiglione and Aprilia along the Anzio-Albano Road, and in the south by the villages of Cisterna and Littoria, a provincial capital, and the Mussolini Canal. The operations at Anzio were to be supported by a general 15th Army Group offensive. One week before the Anzio assault, the Fifth Army, consisting of the U.S. II Corps, the British 10 Corps, and the French Expeditionary Corps, would launch a massive offensive on the Gustav Line, cross the Garigliano and Rapido Rivers, strike the German Tenth Army under Lt. Gen. Heinrich van Vietinghoff in the area of Cassino, breach the enemy line there, push up the Liri valley, and link up with the forces at Anzio for the drive on Rome. Meanwhile, Allied, British, and Commonwealth forces of the Eighth Army were ordered to break through on the Adriatic front or at least tie down German forces to prevent their transfer to the Anzio area. encouraged Lucas to do the same, leaving the decision about how far and how fast to advance to the VI Corps commander. The XII Tactical Air Command, the British Desert Air Force, the Coastal Air Force, and the Tactical Bomber Force, units which were supporting Allied operations throughout the entire Mediterranean theater, were directed to conduct major air assaults in support of the Anzio landings. The approximately 2,600 available Allied aircraft were to gain air superiority over the beach, provide close air support for the invading forces, and destroy enemy airfields and hinder communications. The 64th Fighter Wing was charged with protecting the battle area during the actual landings from some 2,000 German aircraft believed to be stationed in Italy and the Balkans. 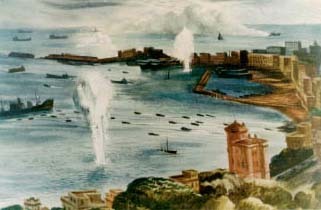 ary move, other naval units were ordered to shell the coastal town of Civitavecchia, forty miles to the north. serves south to counter the Allied attacks on the Garigliano on 18 January, leaving one nine-mile stretch of beach at Anzio defended by a single company. The first Allied waves landed unopposed and moved rapidly inland. On the southern flank of the beachhead the 3d Division quickly seized its initial objectives, brushing aside a few dazed patrols, while unopposed British units achieved equal success in the center and north. Simultaneously, Rangers occupied Anzio, and the 509th Parachute Infantry Battalion seized Nettuno. All VI Corps objectives were taken by noon as the Allied air forces completed 1,200 sorties against targets in and around the beachhead. On the beach itself, the U.S. 36th Engineer Combat Regiment bulldozed exits, laid corduroy roads, cleared mines, and readied the port of Anzio to receive its first landing ship, tank (LST), an amphibious assault and supply ship, by the afternoon of D-day. By midnight over 36,000 men and 3,200 vehicles, 90 percent of the invasion force, were ashore with casualties of 13 killed, 97 wounded, and 44 missing. During D-day Allied troops captured 227 German defenders. Allied units continued to push inland over the next few days to a depth of seven miles against scattered but increasing German resistance. In the center of the beachhead, on 24 January, the British 1st Division began to move up the Anzio-Albano Road toward Campoleone and, with help from the 179th Infantry Regiment of the 45th Infantry Division, captured the town of Aprilia, known as "the Factory" because of its cluster of brick buildings, on 25 January. Within three days the continuing Anglo-American drive pushed the Germans a further 1.5 miles north of the Factory, created a huge bulge in enemy lines, but failed to break out of the beachhead. Probes by the 3d Division toward Cisterna and by the 504th Parachute Infantry Regiment toward Littoria on 24-25 January made some progress but were also halted short of their goals by stubborn resistance. Renewed attacks on the next day brought the Americans within three miles of Cisterna and two miles beyond the west branch of the Mussolini Canal. But the 3d Division commander, Maj. Gen. Lucian K. Truscott, Jr., on orders of the corps commander, called a halt to the offensive, a pause that later lengthened into a general consolidation and reorganization of beachhead forces between 26 and 29 January. OKW, Kesselring, and Brig. Gen. Siegfried Westphal, Kesselring's chief of staff, were astonished that the Anzio forces had not exploited their unopposed landing with an immediate thrust into the virtually undefended Alban Hills on 23-24 January. As Westphal later recounted, there were no significant German units between Anzio and Rome, and he speculated that an imaginative, bold strike by enterprising forces could easily have penetrated into the interior or sped straight up Highways 6 and 7 to Rome. Instead, Westphal recalled, the enemy forces lost time and hesitated. As the Germans later discovered, General Lucas was neither bold nor imaginative, and he erred repeatedly on the side of caution, to the increasing chagrin of both Alexander and Clark. combat troops, most already deployed in forward staging areas, with several thousand more on the way. still possible even though German resistance all along the perimeter of the beachhead was becoming stronger. The 3d Division and the 1st, 3d, and 4th Ranger Battalions under Col. William O. Darby were responsible for the initial attack on Cisterna. The 1st and 3d Rangers were to spearhead the assault by infiltrating the German lines and seizing and holding Cisterna until the 4th Rangers and 15th Infantry, 3d Division, arrived via the Conca-Cisterna Road. Meanwhile, at 0200, 30 January, the 7th Infantry, 3d Division, was to push on the left to a point above Cisterna and cut Highway 7, while the 15th Infantry passed to the right of Cisterna and cut the highway south of town. As a diversion the 504th Parachute Infantry Regiment would attack along the Mussolini Canal. Unknown to the Americans, their assault was aimed directly at the center of the area where thirty-six enemy battalions were massing for their 1 February counterattack. and numbers. Efforts by the 4th Rangers and 15th Infantry to rescue the beleaguered units failed, and by noon armored units of the Hermann Goering Division had forced the Rangers into the open. The Americans had only grenades and bazookas for antitank weapons, and as they attempted a fighting withdrawal in small and scattered groups they were cut down mercilessly. Of the 767 men in the two battalions, only 6 eventually returned to Allied lines. In spite of the disaster that befell the Rangers, the 7th and 15th Infantry regiments continued their attacks toward Cisterna, one soldier recalling that the defenders clung stubbornly to their entrenched positions while launching locally heavy counterattacks. Sgt. Truman O. Olson, a light machine gunner with Company B. 7th Infantry, took part in one sixteen-hour assault on entrenched enemy positions in which one-third of his company became casualties. Having seized a toehold, the survivors dug in while Sergeant Olson and his crew took their one available machine gun and placed it forward of the line to bear the brunt of an expected enemy counterattack. Although he had been firing without respite all day, Olson stuck grimly to his post throughout the night while his gun crew was killed, one by one, by accurate and overwhelming enemy fire. Weary from over twenty-four hours of continuous battle and suffering from an arm wound, Olson manned his gun alone, meeting the full force of a 200-man enemy dawn assault supported by mortars and machine guns. After thirty minutes of fighting, Olson was severely wounded, but he refused evacuation. For an hour and a half after receiving a second and subsequently fatal wound, he continued to fire his machine gun, killing at least twenty of the enemy, wounding many more, and ultimately forcing the attackers to withdraw. For his actions Sergeant Olson was posthumously awarded the Medal of Honor. The failure of the Allied breakout attempt, stymied by stiff resistance, convinced Alexander, Clark, and Lucas that an enemy counterattack must be in the offing. 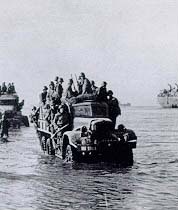 Reinforcements were rushed to Anzio, including 1,800 men of the American-Canadian 1st Special Service Force, elements of the British 56th Division, and additional antiaircraft and artillery units, raising the total number of Allied soldiers in the beachhead to 100,000. Despite these additions, the Fourteenth Army outnumbered the Allies at Anzio by 4 February. But the German force was a hodgepodge of rapidly thrown together units. All were critically short of ammunition, training, qualified leaders, and reserves. Allied air attacks had disrupted communications, hampered troop and supply movements, and caused morale problems. From the outset Mackensen had doubted the available force could eliminate the Anzio beachhead, but he prepared a forceful counterattack nonetheless. 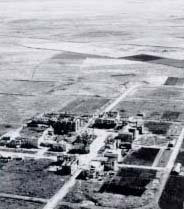 The 4th Parachute and 65th infantry Divisions of the I Parachute Corps were to pinch off the Campoleone salient and recapture the Factory at Aprilia. The same units would then break through to the sea along the Albano Road. Elsewhere the LXXVI Panzer Corps, consisting of the 3d Panzer Grenadier, 715th Motorized Infantry, 71st Infantry, Hermann Goering, and 26th Panzer Divisions would attack south of Cisterna along the Mussolini Canal and attempt to breach the Allied perimeter and advance on Nettuno and Anzio. the Campoleone salient. The British held, despite suffering 1,400 casualties, but their dangerously exposed position prompted Lucas to order their withdrawal to one mile north of the Factory and Carroceto on the night of 4-5 February, a retreat of about 2.5 miles. Although the salient was eliminated, the Germans failed to break the Allied line or retake the Factory. 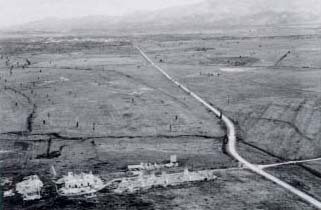 The undulating and soggy Albano Road area was just as inhospitable to German armor and infantry as it had been to Allied forces the week before. However, the critical situation the Germans created in the Allied center convinced Lucas to form a beachhead defense line running from the Moletta River in the north, through the fields of the central sector, to the Mussolini Canal in the south. He issued orders to all Allied troops that this was the final line of resistance to be held at all costs-the shallow beachhead precluded any further retreat. 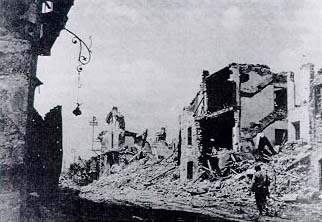 The Germans could ill afford the loss of the 5,389 men killed, wounded, and missing during their five-day counterattack. Enemy troop morale plummeted, and many units lost their offensive capability. The 65th Infantry Division's combat strength had dropped to 673 effectives by 23 February, and one regiment of the 715th Motorized Infantry Division numbered fewer than 185 men. Allied casualties numbered some 3,496 killed, wounded, or missing in addition to 1,637 nonbattle casualties from trench foot, exposure, and combat exhaustion. Allied commanders at Anzio often claimed that losses would have been lower if soldiers were periodically rotated away from the lines, but replacements simply were not available. All 96,401 Allied soldiers were required to hold the 35-mile perimeter against an estimated ten German divisions in the Fourteenth Army, totaling 120,000 men by 12 February. Despite the fact that their drive to eliminate the Anzio beachhead with an attack down the Albano Road had failed, the Germans resumed the offensive on 29 February. This time their main effort was directed against the U.S. 3d Division holding the Cisterna sector of the Allied beachhead. The LXXVI Panzer Corps, consisting of the 114th Light Infantry, 362d Infantry, 26th Panzer, and Hermann Goering Divisions began a drive to breach the outer beachhead defenses from Carano to Isola Bella, which, if successful, would be exploited by the 29th Panzer Grenadier Division all the way to Nettuno and Anzio. The Americans, however, had anticipated this move. General Truscott, who had replaced Lucas as VI Corps commander on 23 February, had reinforced the line with additional artillery. Further, he made certain that each unit had at least one battalion in reserve with additional reinforcements available at the corps level. trenched Americans, supported by closely coordinated artillery, armor, and air support, shattered subsequent German attacks. Even though the 7th and 15th Infantry regiments and the 509th Parachute Infantry Battalion often were hard pressed and suffered heavy losses between 1 and 4 March at the hands of the 715th and the 16th SS Panzer Grenadier Divisions, all three units held their positions and beat back successive enemy assaults. The Germans continued to seek a breakthrough, but their efforts gradually weakened. Mackensen realized that the Fourteenth Army had spent itself in a costly and futile offensive after a last German assault failed on 4 March. On 22 May the entire U.S. 36th Infantry Division landed, bringing the total number of Allied troops at Anzio to seven full divisions. Supply problems at Anzio, originally one of the main concerns of Allied planners, never reached a crisis stage. 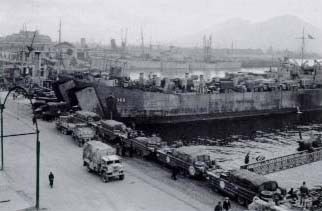 Beginning on 28 January, six LSTs left Naples daily for Anzio, each carrying 1,500 tons of cargo distributed among fifty combat-loaded trucks. Driving off the ships at Anzio, the trucks moved directly to front-line positions with ammunition, fuel, and rations and were replaced on the LSTs by the fifty empty trucks that had made the voyage the previous day. In addition to LSTs, fifteen smaller vessels arrived each week, and every ten days four massive Liberty ships delivered heavier equipment. Between 22 January and 1 June over 531,511 long tons of supplies were unloaded at Anzio, a daily average of 3,920 tons. drive east through the Velletri Gap to Valmontone, cut Highway 6, the main German route of retreat, and trap the bulk of the enemy forces withdrawing north through the Liri valley. The basic operational concept had been dictated to Clark by Alexander, who was acting on Churchill's desire to destroy the entire Tenth Army south of Rome at Valmontone. Clark, however, had little faith in the feasibility of the plan. Furthermore, he believed that most of the recognition for Allied gains thus far obtained in Italy had been attributed unjustly to British forces, and he wanted the Fifth Army to have the singular honor of liberating Rome. He therefore informed Truscott that the VI Corps was to be prepared at any moment during the breakout to swing north for a rapid advance on the Italian capital, especially if stiff enemy resistance was encountered on the route to Valmontone or if the British advance up the Liri valley was slower than planned. Earlier on 25 May, at 0730, troops of the 91st Reconnaissance Squadron, 85th Infantry Division, U.S. II Corps, racing north from Terracina across the Pontine Marshes, met soldiers of the 1st Battalion, 36th Engineer Combat Regiment, from the Anzio beachhead, effecting the long-planned and longer-awaited link-up between Fifth Army forces. With the physical juncture of the II and VI Corps, the beachhead ceased to exist and the formerly isolated soldiers became the left flank of the Fifth Army. Clark personally greeted the II Corps troops three hours later. effective strength, were inflicted between the initial landings and the end of the German counteroffensive on 4 March. Of the combat casualties, 16,200 were Americans (2,800 killed, 11,000 wounded, 2,400 prisoners or missing) as were 26,000 of the Allied noncombat casualties. German combat losses, suffered wholly by the Fourteenth Army, were estimated at 27,500 (5,500 killed, 17,500 wounded, and 4,500 prisoners or missing)-figures very similar to Allied losses. force accomplished all that could have been realistically expected. Lucas' critics charge, however, that a more aggressive and imaginative commander, such as a Patton or Truscott, could have obtained the desired goals by an immediate, bold offensive from the beachhead. Lucas was overly cautious, spent valuable time digging in, and allowed the Germans to prepare countermeasures to ensure that an operation conceived as a daring Allied offensive behind enemy lines became a long, costly campaign of attrition. For additional reading see William L. Allen, Anzio: Edge of Disaster (1978); Fred Sheehan, Anzio: Epic of Bravery (1964); and Martin Blumenson, Anzio: The Gamble That Failed (1963). For a British perspective, see Wynford Vaughan-Thomas, Anzio (1961). The official U.S. Army histories, which include Martin Blumenson, Salerno to Cassino (1969); Ernest F. Fisher, Jr., Cassino to the Alps (1977); and the War Department Historical Division, Anzio Beachhead, 22 January-25 May 1944 (1948), remain the most comprehensive histories available on the overall operational and tactical aspects of the Anzio Campaign.